This is toooo coool! I have played with the SCRAP DOTS! I love them!! Check them out on Facebook or their blog to get all the giveaway info.!! Helmar Rocks!!! I am so excited! 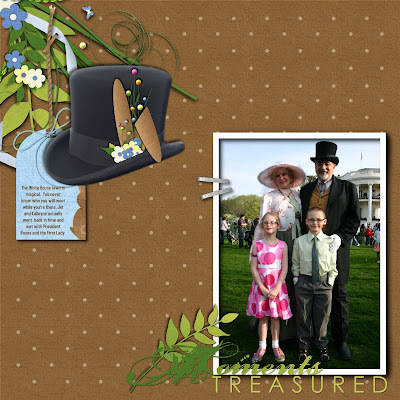 I was asked by the wonderful Jen Martakis to be a guest designer for August. Jen has the cutest kits! 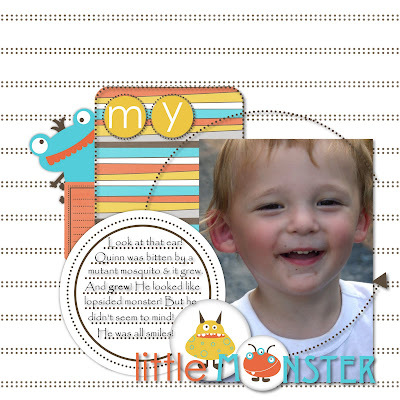 This week I am designing with her Monsters Digi Kit! You can find Jen Martakis Designs at 2Peas. Been catching up on some of my layouts. My free time is almost over. Life will be getting busy again soon. 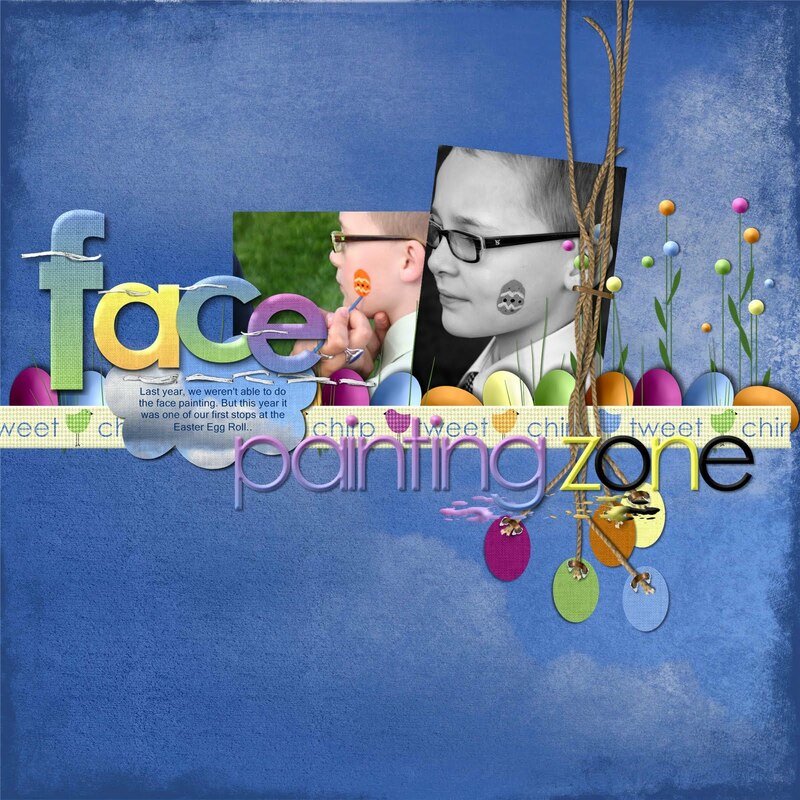 So, I did this layout using Janet Carr's Bunny Trail Digital Kit and her Bunny Trail Digital Freebie Kit. Hi everyone! I know. I know. Long time no see! It has been crazy around here. I am just so happy it has slowed down for a moment so I can scrapbook for myself. I have been working on my White House Easter Egg Roll Album. My scrapbook room is not all moved in yet, so I have decided to do it all digitally. And I am LOVING it! I have been using the Bunny Trail Digital Kit by Little Feet Digital Designs . Another awesome kit by Janet Carr! This is a two page layout.. I love the carrots! I will be back soon to post more! I have to get a scrappin'. Before life gets crazy for me again. That would be tomorrow! See ya soon! Janet Carr Rocks!! Tickets! Tickets! Tickets! And Prize Time! 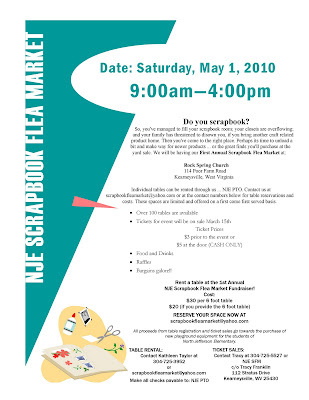 TICKETS FOR THE 1ST ANNUAL SCRAPBOOK FLEA MARKET ARE ON SALE NOW! 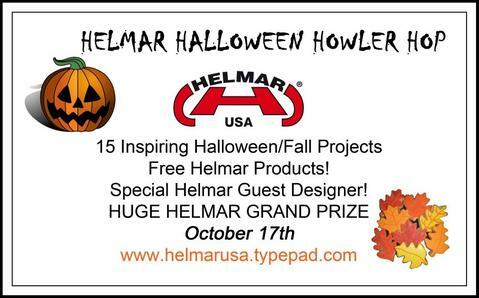 AND READ THE BOTTOM OF THIS BLOG ENTRY FOR A CHANCE TO WIN A PRIZE THAT WILL BE GIVEN AWAY THE DAY OF THE FLEA MARKET! GET THEM NOW AND SAVE $2.00 ON YOUR TICKETS!!! and we will get you taken care of! Then see the blog post below! We are very excited about this! And the wait is almost over! We want to know if you are coming and from where! And you can WIN A PRIZE by just telling us that you are coming! Leave a comment with your name on my blog letting me know that you are coming! Then, your name will be entered in a VERY SPECIAL DRAWING! A Drawing that you can ONLY be entered in if you leave a comment on my blog! Want to know what it is? Well, I will give you a hint! It is Scrapbook Supplies! Yes, I know it is a lame hint! But you will not be disappointed! I will post a picture of the prize before the Flea Market! So keep checking my blog! WINNER WILL BE ANNOUNCED AT THE SCRAPBOOK FLEA MARKET!!! AND YOU CAN ONLY WIN IF YOU ARE AT THE SCRAPBOOK FLEA MARKET! 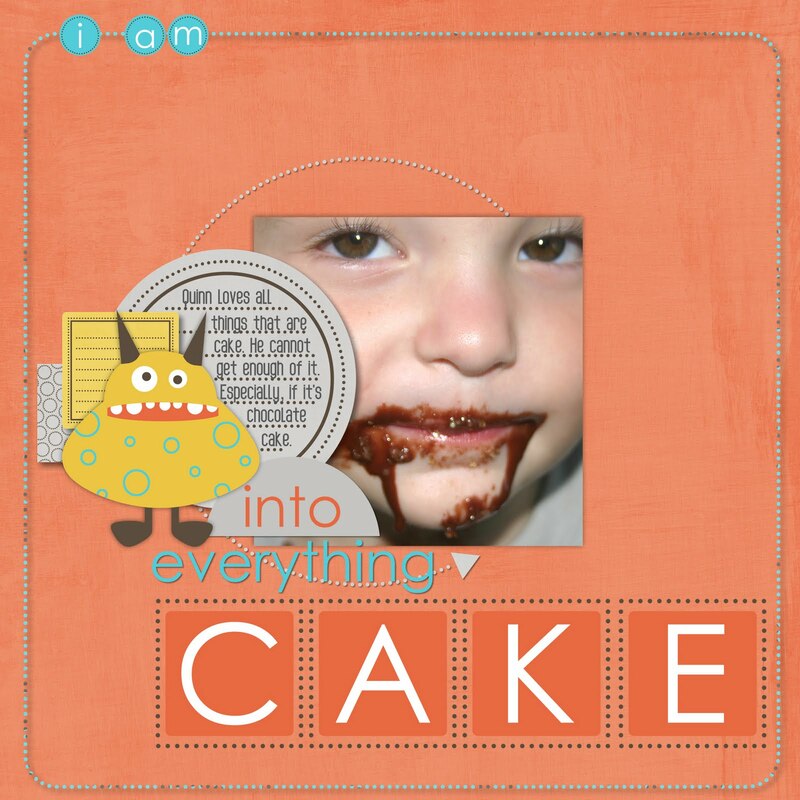 I know when you hear that there is a Scrapbook and Stampin' Flea Market in West Virginia, you may think it is a LONG way away from VA, MD, PA and DC. Well, it is not. We are close. We are in that tiny tiny panhandle that is close to all of you. I wanted to post some driving directions. So you can see we are closer than you think. We have over 50 tables sold already. And people are letting me know that they are "in" for this. Even I am cleaning out my scrapbook room. And trust me I have a lot I would LOVE to clear out for LOW LOW BARGAIN PRICES! Seriously, you do not want to miss this!!!!! Just click on the City/State link you are close to and it will direct you to mapquest with the directions. See you there on May 1st! Scrapbook Flea Market Tickets on Sale Now! Well, then what are you waiting for? Tickets are just $3.00 when you buy them in advance! your special wrist band waiting for you! receive updates on the Flea Market, Tickets, Raffles, etc. All proceeds from table registration, ticket sales raffles and food sales, go to purchase new playground equipment for the students of North Jefferson Elementary. is OFF AND RUNNING! In less than 24 hours we have reserved 35 tables! Do not forget, Tickets go on sale this coming Monday. I will post where to send your checks to then. And thank you so much for supporting North Jefferson Elementary!!! 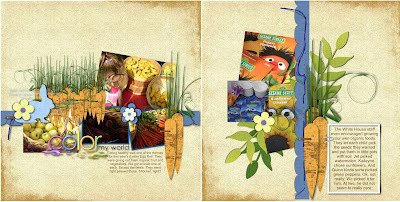 Scrapbook Flea Market - Table Registration Open! We have finalized the date, time and place! Now it is time to get moving! 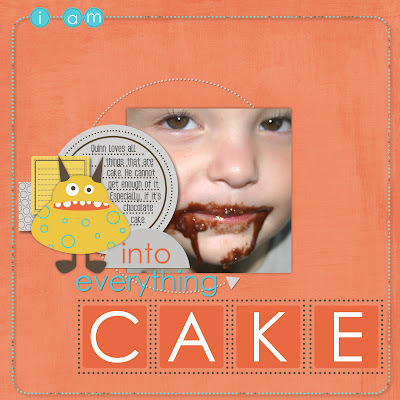 Do you have tons of scrapbook or stamping items that you thought you would use? That you were saving for that "special" layout? Or tools that were cool but for some reason were never used? And now all those items are just there. Clogging up your room and falling out of your closet! Well, it is almost Spring! And it is time to get to Spring Cleaning! NJE Scrapbook Flea Market Fundraiser! We have over 100 spots available! If you need more than one table (like I do), just let us know! All proceeds from table registration and ticket sales go to purchase new playground equipment for the students of North Jefferson Elementary. So, do not wait... register now! Ticket Prices are $3.00 prior to the event or $5.00 at the door (CASH ONLY). Your ticket to the flea market is a tax deductible donation. Cash Receipts for your tax deductible donation will be available at the door for your $5 admission fee. NJE Scrapbook Flea Market Yahoo Group.. In the meantime , we have created a Yahoo Group for you all. Not only will you receive updates and announcements, but you will receive them at least 24 hours before they are posted to my blog or other scrapbook websites. So, you can get a jump on when table rentals and ticket sale registration opens. Right now the group is closed to public posts. All messages will be coming from the group moderators. Thank you again in advance for your interest and help with raising money for North Jefferson Elementary! So, I went to a crop 2 hours away, James went out with his friends for the night and the kids were at Grandma's house (an hour away). Well, they were wrong! Wayyyy Wrong! I got to the crop at 8 am and I had to leave at 1pm because there was about 4 inches on the ground. I left and it took me 4 hours to get home. The roads were a nightmare. Tractor trailers jackknifed, cars abandoned, other cars turned around with busted front ends, and cars stuck in the medians. It was ugly! James picked up the kids at 2:30 pm. He got home 15 minutes after I did. he was coming from the other direction. He said the roads were just as bad. We were all so happy to be home. And safe. Well, gotta run! Need to go and shovel some snow. 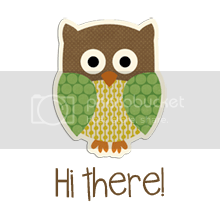 Do you love Digital Freebies? Now that I have been dabbling in digital. I do! It's like going into my LSS when they are having an embellishment sale. I squeal like a little girl! And when you work with so many talented Digital Designers at Creative Memories, it is hard not to get excited when they create something and share it with all of us. For FREEEEEEE! Want an example... SURE YOU DO! I am so glad you asked! 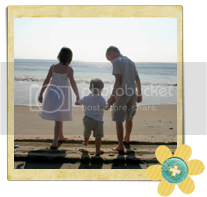 And she has a Digital Freebie Blog! 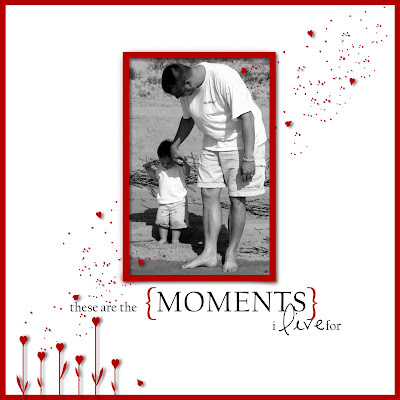 I just looked there the other day and I say this page template she had as a freebie. All I had to to was drop a picture into it...I love love loveeeeee it! Do you want it? I know you do! CLICK HERE to get it! Ok not new, but redesigned! Isn't is beautiful? I see your heads nodding .... Excellent! 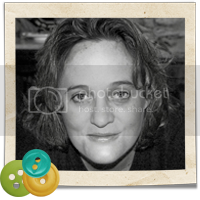 My Blog Makeover was done by a very wonderful and talented Kristina Proffitt! And she did it so quickly. One day my blog was boring..the next Ka-Blowwee! Perfection! Kristina and her partner Crystal Wilkerson have created templates for your blog that are just so bright and inspirational! The name of her business is Blog Designs by Two Happy Mommas. You need to check them out! You will not be disappointed! As you all know, I am quite the bad blogger. I never knew why, but I think it was because my blog was so..well....blech! Boring! Dull! Not anymore! I cannot tell you how many times I have come to my blog today. I love it! So, I had to share it all with you! And I am sure you will see a lot more of me now too! Thank you Kristina! Thank you Crystal! You guys ROCK!!!!!!!! NJE Scrapbook Flea Market is Coming!!!! Yes! That is right! A Scrapbook Flea Market is coming to West Virginia! It is a fundraiser for new playground equipment for North Jefferson Elementary! So, it is a place to find great scrapbook bargains and raise money for our school. Stay tuned for more information....Table Rental and Ticket Information will be coming soon ! Please check my blog for updates! All proceeds go to North Jefferson Elementary PTO.